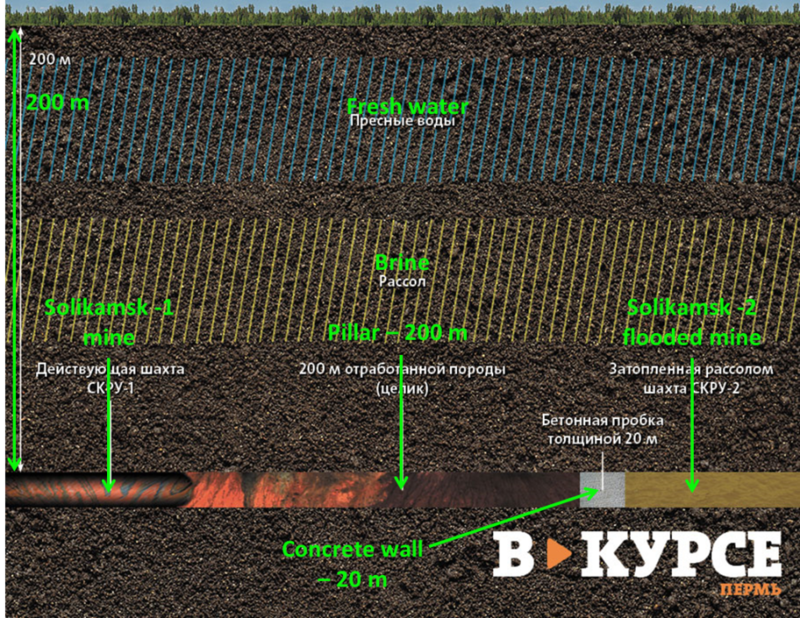 After a statement made by one of the world’s largest potash producers and exporters Uralkali (MCX:URKA)(LON:URALL), first visual implications of Solikamsk-2 potash mine accident have been revealed. 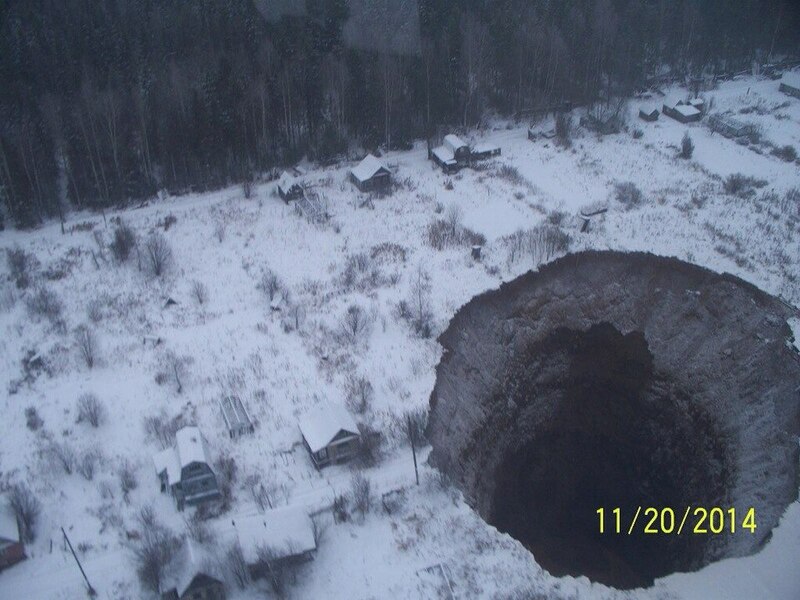 30-40 meters diameter sinkhole near the Solikamsk-2 potash mine (source: V-kurse.ru). 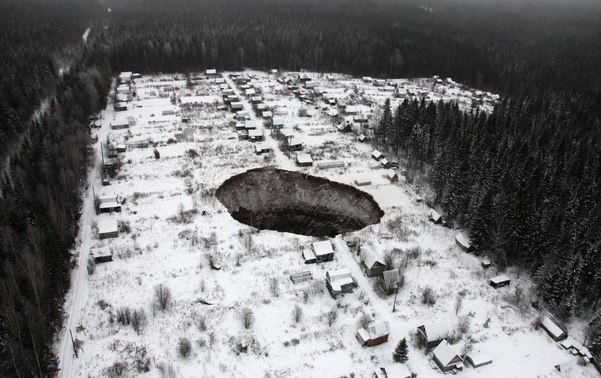 A sinkhole with a diameter of 30-40 meters has been detected to the east of the Solikamsk-2 production site, at the area packed with summer cottages. There were no casualties reported so far. BEIJING — Ten Chinese miners were found dead Sunday hours after they were trapped underground in an explosion at a mine in the northeastern province of Heilongjiang, state media said. The cause of the incident at the Xingyun Mine in the city of Jixi was under investigation, the state-run China News Service said. China’s mines are the world’s deadliest, although a push to boost safety has considerably lowered death tolls in accidents. Just over 1,000 deaths in 604 coal mining accidents were reported in 2013, down from more than 6,000 per year a decade ago. At the same time, demand for coal has plateaued as China’s economy decelerates from the headlong rush of the last decade. Police in Papua New Guinea say at least three miners have been killed after a disturbance at the Porgera gold mine site in Enga province. They say the trouble started when a mobile police squad was deployed to the mine to investigate the deaths of two illegal miners who fell into a pit. PNG’s Deputy Commissioner of Police Operations Simon Kauba says a confrontation took place when officers arrived. “There was this confrontation from the illegal miners, those who were with those two who were deceased, and so they were dispersing them, and in the process may have been hurt, and later we found out one or two other people died from the confrontation,” he said. Mr Kauba says extra police have been sent to the mine, which remains temporarily closed. “[The] situation is not looking good but it is brought under control,” he said. In separate incidents two mine personnel were attacked and injured by groups of illegal miners, Barrick said in a statement. Spokesman Greg Walker says the company had earlier asked for police help to remove illegal miners who were massing in large numbers at the mine’s open pit area. The company says it is investigating the incident and its causes. A gas explosion killed as many as 25 people in an illegal gold mine in eastern Guinea, area that holds some of the West African country’s largest gold reserves. While artisanal mining in mineral-rich Guinea is not illegal, it is extremely dangerous. In July four people were killed in a similar incident. Other than gold, artisanal miners tend to look for diamonds in the country, which is an important source of them. In 2011, it put out 300,000 carats valued at about $30 million, and industrial production is in the development phase. As well, the country hosts several kimberlite deposits. However, due to regulatory deficiencies, data gaps, limited technical capacity and uneven enforcement in small-scale mining, the country is a thoroughfare for conflict diamonds to enter the international market. Guinea is also one of the world’s main exporters of bauxite and holds vast untapped iron ore reserves that have lured large global miners, such as Rio Tinto and Chinalco. The Taozigou coal mine is unauthorized according to officials. It’s located in China’s Sichuan Province, Luxian County and in the city of Luzhou. At the time of the accident there were 108 miners working underground, many of whom had to be rescued. The deputy governor of Sichuan, Liu Jie, said the mine should be shut down and all coal mining in the province should be suspended pending a review. Work at two of Rio Tinto’s Pilbara mining operations have been halted this morning after a 27-year-old man died when a container fell on him, according to police. A Rio Tinto spokesman said the man was changing a hydraulic cylinder on a front-end loader in the mobile-equipment workshop when he was killed. His co-worker raised the alarm, and Tom Price police were alerted to the man’s death immediately after the accident at around 8pm. “Somehow some equipment came lose and he was trapped,” the spokesman said. The two mines sites will be closed for at least the rest of today. A decision has not yet been made on when the operations will recommence. A Department of Mines and Petroleum spokeswoman said a representative would arrive at the mine site today to investigate the accident & death. Colleagues and family of the deceased man have been offered Rio Tinto’s counselling and support service. WA unions expressed sorrow at the workplace death and reiterated its call for the state government to adopt some stronger health and safety laws. From the start of 2012 WA will have the weakest health and safety laws in Australia as new uniform laws take effect in every state and territory except WA, a spokeswoman said. Queensland’s environment department says an alumina refinery owned by Rio Tinto has spilt sulphuric acid into a creek in central Queensland. Rio Tinto notified the Department of Environment and Resource Management that the spill occurred at the Yarwun alumina refinery on Sunday during heavy rain. DERM spokesman Joe Pappalardo said an unknown amount of the acid was released into Boat Creek when the site’s stormwater system overflowed in heavy rain. Urgent inspections and water sampling has been done at Boat Creek and nearby Port Curtis, at Gladstone. “Inspections by DERM officers … have found no evidence of environmental harm suggesting that the recent rain and high tides in Boat Creek have helped to dilute the acid and flush it through the system relatively quickly,” Mr Pappalardo said. Investigators are looking at the cause of the spill, how much sulphuric acid was involved and the actions taken by Rio Tinto. Mr Pappalardo said it looks as though it’s been a lucky escape for the environment. A Rio Tinto spokesman said it is estimated that 3000 litres sulphuric acid was released when a drain valve failed. “The vast majority of the sulphuric acid was contained within the on-site spill capture system,” the spokesman said. The drain valve has been removed from service and will remain out of operation until repaired and investigations are completed. THE ”live” televised rescue of 33 trapped miners in Chile, which appeared to the world as a flawless operation, was edited to disguise dangerous problems, a new book claims. 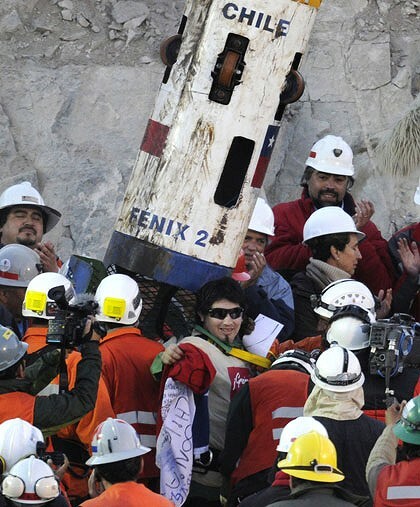 In a slick media operation the Chilean authorities covered up the fact that the rescue shaft had been destabilised and a rockfall had cut a cable between the surface and the chamber more than 600 metres underground. The live TV feed was at one point interrupted and video clips from earlier on in the rescue recycled to allow emergency repairs to be carried out unseen during the 22-hour operation to haul the men up from the deep, which began on October 12. The revelation comes in a book published today in Australia entitled Los 33, which charts the men’s entombment in the San Jose gold and copper mine deep below the Atacama Desert in northern Chile. ”A billion viewers around the world were … tricked,” said Jonathan Franklin, the author of the book, who gained special access to the rescue operation while most news media were excluded. The book provides an insight into the high-profile role played by the country’s President, Sebastian Pinera, who was at the surface of the mine and the first to greet the rescued men as they emerged from the Phoenix capsule into fresh air after more than nine weeks below ground. But he had wanted to be the first man lowered down in the metal cage to join the miners underground, because he was ”enthralled” by the idea of personally vouching for its safety. ”Security aides to the President were apoplectic,” Franklin writes. At one point during the rescue a heated argument broke out between the naval officers overseeing the extraction down below and a local official lowered down to help. The interloper was quickly forced to return to the surface under threat of force. But thanks to ”judicious editing … the world saw not a single second of this centre-stage drama”, Franklin writes. The book also sheds light on the first 17 days following the mine collapse and before contact was made with the surface. During that time of extreme food rationing the men considered resorting to cannibalism.